Over at FB, a friend of mine posted a link to an article by Gene Marks, entitled "If I Was a Poor Black Kid." First, let's take a moment to mourn the death of the subjunctive. Now, take a look at the article, and then come back -- I'll wait here. Look, let's start from a place of charity, and presume that Marks means well. If this were a student's paper, I'd have to ask myself, "What's the kernel of thoughtful goodness at the heart of this condescending, tone deaf mess?" More importantly, I'd have to figure out how to help the writer understand not just that this is highly problematic, but how to make the next paper less problematic than the last. So, what comments would I give to Gene Marks, if he were my student? First, a stronger essay would be more conscious of audience. Who is likely to read your article? 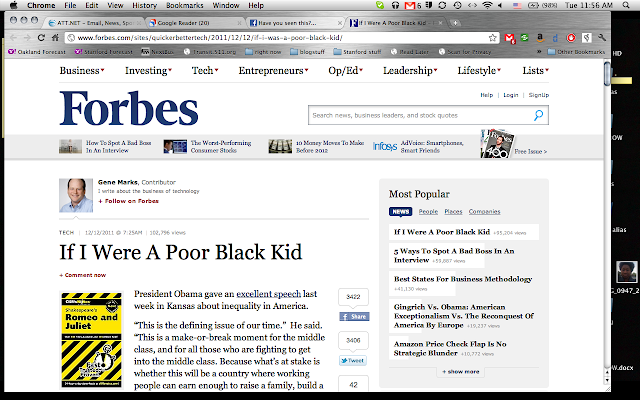 How many of your readers are the "poor black kids" you refer to, or poor kids of any color? How many are likely to be, like you, middle-class white men? If more are likely to be the latter, how might it affect your understanding of some of your basic claims, like "Technology can help these kids. But only if they want to be helped" and "the biggest challenge we face is not inequality… [but] ignorance"? Having a better sense of who the article is intended for might have led you to make different decisions in your writing. For example: how does it contribute to your points to adopt the stance of "being" a poor black kid? Aren't you actually writing about what advice you, as a middle-class white man with experience in technology-related fields, can offer? What would you have to know about the frame of reference, resources, or needs (physical, emotional, motivational, educational, etc) of poor black kids to make your evaluation of and advice for them more compelling, and less condescending? Your essay contains many potentially useful suggestions, but it's not clear how you expect them to reach the poor black kids you claim they're for. You say that it takes "brains...[,]hard work...[,]a little luck...[,] a little help from others...[, and] the ability and the know-how to use the resources that are available," yet you say nothing about how those brains must be nurtured, how the hard work is to be accomplished with little support system, how we are to ensure that "luck" is just that (nothing more systemic), that those who need help know how to get it, and that students - especially students in lousy schools - can be given access to the ability and know-how necessary to take advantage of the resources. How are they to take advantage of these opportunities that they do not, according to your essay, even know about? How are they supposed to develop the skills (use the tools) that you recommend they keep sharp, with (according to your article) no parent of teacher to push them in the right direction, as your kids (also according to your article) need to be pushed? Finally, and perhaps most importantly: you begin by saying that it's not a matter of intelligence – your kids, you say, are no smarter than the poor black kids you refer to. How, then, do you explain your final statement, that "the opportunity is still there in this country for those that are smart enough to go for it"? Do you actually mean to imply that poor black kids are just not going for it, and that they're not going for it because they're not smart enough? What, exactly, is your thesis? Please feel free to come to my office hours if you'd like to discuss these issues further. ETA: It looks like Mr. Marks (or perhaps a copy editor) corrected the article title, though you can still see the original error in the URL. If only it were as easy to shame someone into checking privilege as it is to shame them into checking grammar.